Bond-A-Rama! is back – Shaun Micallef Online! 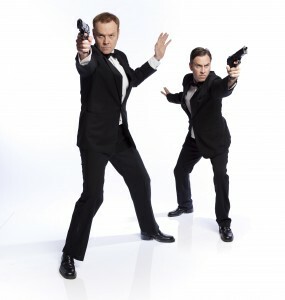 Stephen Hall and Michael Ward – both part of the writing team for Mad As Hell and many other Shaun related projects – are bringing back their stage show, Bond-A-Rama! If you didn’t think it was possible to fit 22 James Bond films into 75 minutes – you were wrong! It’s all recreated, from the villians, the Bond girls. to the stunts and gadgets. Emily Taheny and Ben Anderson, both Micallef alumni, round out the cast. I went to see it last year, and highly recommend it. Whether you’re a true James Bond nut, or have just seen a few of the films, you’re going to enjoy this.